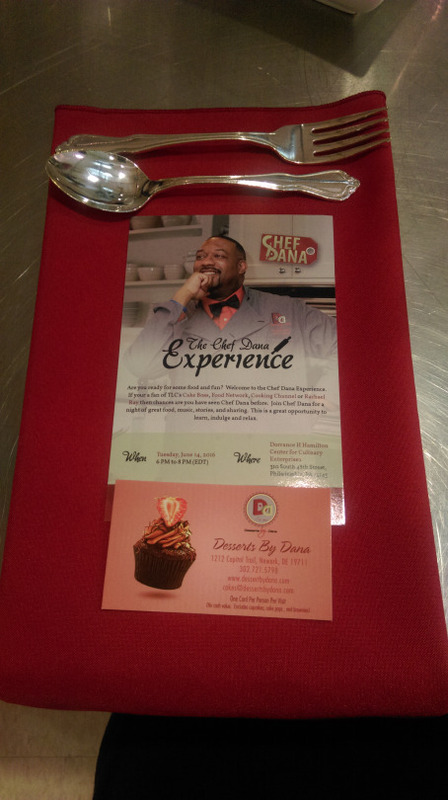 On Tuesday June 14th, I attended the Chef Dana Experience at the Dorrance H. Hamilton Center for Culinary Enterprises in Philly! For those of you who are unfamiliar with Chef Dana Herbert, he’s a well-known celebrity chef who is also master at baking. Dana was the winner on The Next Great Baker which airs on TLC. He’s also been featured on many television networks such Fox, WETv, ABC, The Food Network and much more. He’s also been featured in many magazines including Essence, Chef Magazine and more! Now that you have a background on Dana Herbert, I’m pretty sure that you must know that this dining event was indeed going to be a night to remember! Upon my arrival, I was happy to see that I was the first guest to get there. I was greeted by Dana and his lovely and welcoming wife Netesha. I sat close enough to enjoy the behind the scenes action while Chef Dana finished preparing for the event. Once the event started, I really liked how Dana made everyone feel comfortable and made it clear that this was an open conversation kind of atmosphere. We all were free to ask any questions, and that was pretty awesome. We also had the chance to go around the room and individually introduce ourselves and we were instructed to name our favorite food. That was quite fun. Here comes the food! Our first course was a pork tenderloin topped with shrimp and a chipotle cream sauce, and paired with a corn salsa. All I could say was “WOW” once I tasted it. I was very impressed with the tenderness of the pork and how bold the sauce was, it was absolutely delicious. Then we enjoyed a refreshing citrus basil lime spritzer. 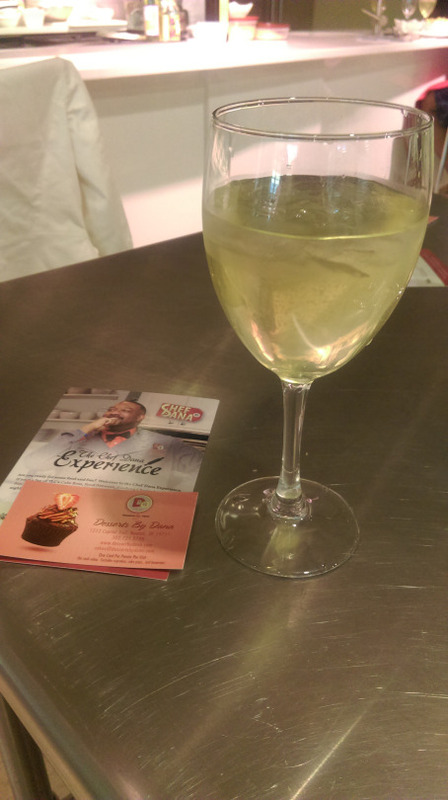 I would definitely love to drink that again. Following the spritzer, we were served the most unique and delicious salad! 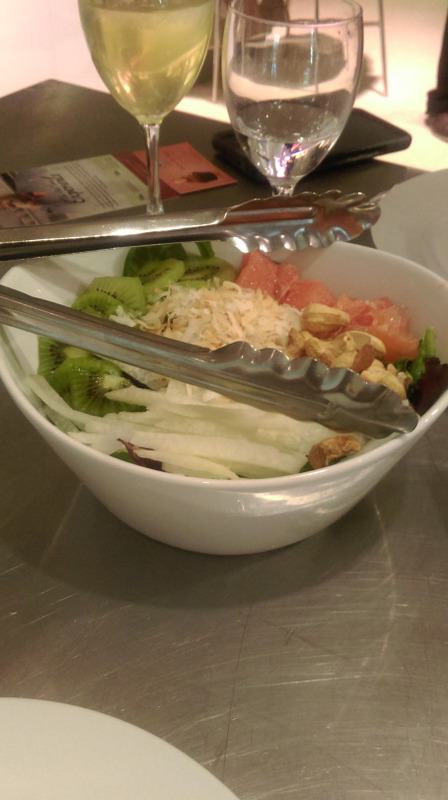 It included grapefruit, cashews, toasted coconut, jimica and kiwi. The dressing was an orange white chocolate vinaigrette. I never would’ve thought to include white chocolate in dressing for a salad, but goodness, did it pair perfectly with everything! We also had the pleasure of enjoying a yummy lemon sorbet. That was a great treat. Afterwards here came the entrée. 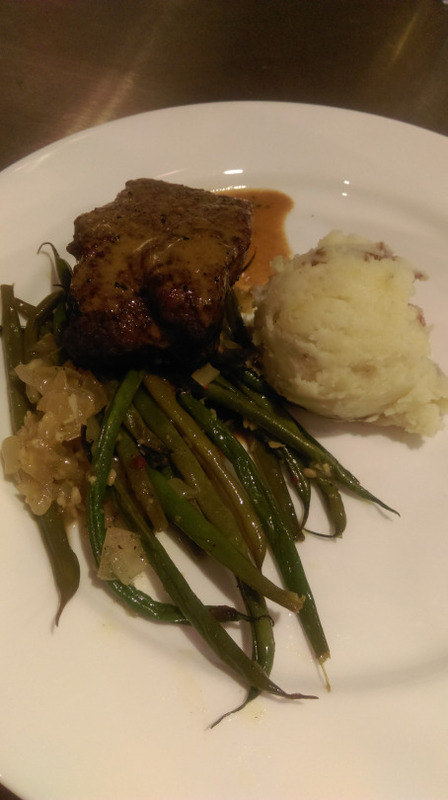 We were served a seared beef sirloin, with mascarpone mashed potatoes, green beans that were sautéed with onions and pine nuts….Chef Dana shared with us the rub that he used for his sirloin, and all I can say is, wow….he’s a genius! After dinner, we sat back and conversation still continued. We were lucky enough to also watch him plate his beautiful dessert. And we were also lucky enough to have him show us how to make it! 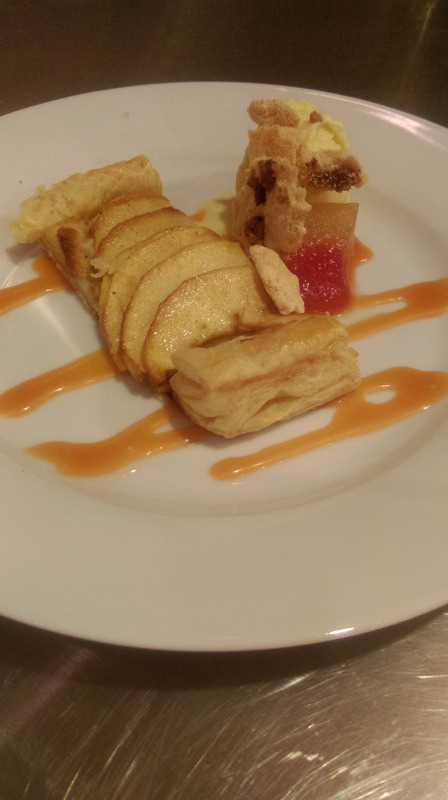 We were served a flaky apple strudel with bacon meringue, pickled watermelon, watermelon caramel and the best corn flavored ice cream that anyone could think of. Yes, how different, but geez was it phenomenal!